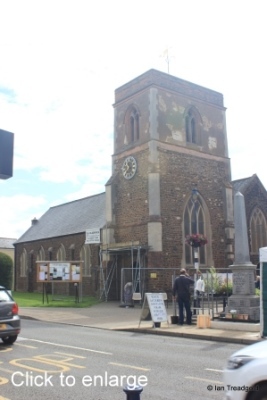 The church of St Michael and All Angels in Shefford is situated on the High Street in the middle of the town. Parking is available in local car parks and on the High Street itself. 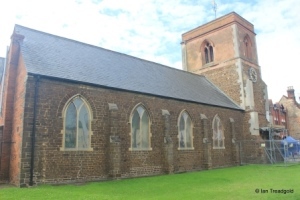 The history of the church is interesting in that until 1903 the parish of Shefford itself did not exist and the church was a chapel of ease under the control of nearby Campton parish. Considering the modern relative sizes of the two places it seems strange that Shefford began life in such a limited way. Whilst the early origins of a building on the site are hazy it is likely it was begun around the time of the granting of a Michaelmas fair to Shefford in the early C14. Parts of the base of the tower are an indication of a presence around that time but later rebuilding has all but removed any evidence of an ancient building. The original building consisted of a nave and tower and the church remained as such until C19. 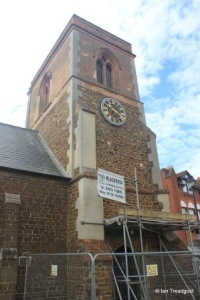 By then, Shefford was growing and needed a church of its own. 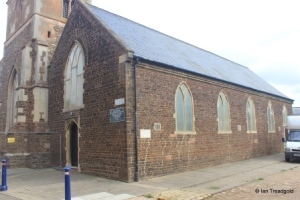 The building was hemmed in with other buildings and it was necessary to gradually acquire land around the church to extend. At various stages, a south aisle was added and the original north porch removed and replaced with a building for the parish fire engine! 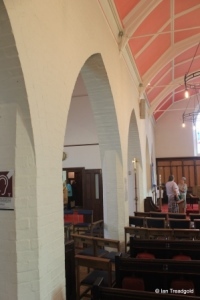 In 1850 with the purchase of further land, the aisle was rebuilt into a second nave separated from the original by iron pillars reminiscent of a Victorian railway station. This southern aisle has become the main nave of the church. The church is around 55 feet in length and some 17 in width. The tower is around 17 feet by 11 feet and some 50 feet in height. 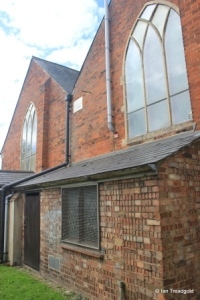 The church became a parish in its own right in 1903 and further works took place including the purchase of the Old School Room which is now used as church rooms at the east of the old nave. The cast iron pillars were replaced with brick during the early C20. 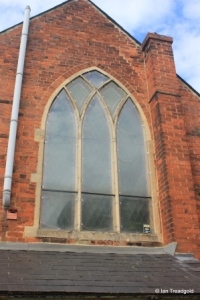 The south side of the church has five simple two light windows with Y-tracery in pointed arches. The west end of the south nave has a three-light window with simply Y-tracery under a pointed arch over the west door. 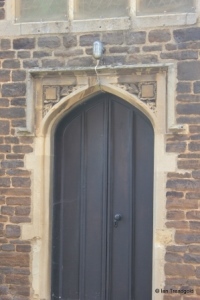 The door has floral motifs in the spandrels. The tower is of three stages with the brick and rendered upper stage being modern. The west window of the tower is similar to that at the west of the south nave. 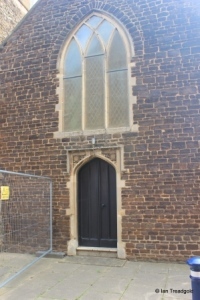 The main entrance to the church is now via a door on the north side of the tower. 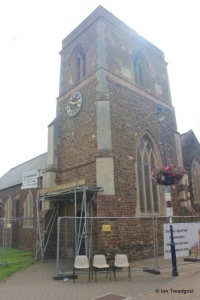 The tower is being prepared for restoration (2017) and there is scaffolding providing protection over the doorway. The north side of the church has four more windows of a similar style to the rest. The east end is still cramped for space with outbuildings along its length. 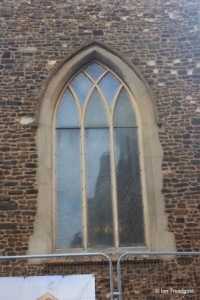 The east windows are similar in style to those on the west end with three lights and Y-Tracery under two-centred arches. 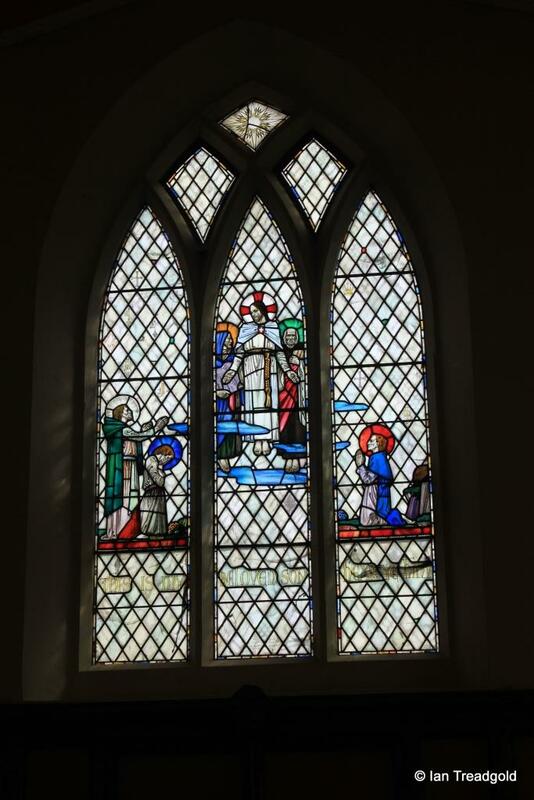 Inside there are several stained-glass windows dating from the 1930’s. 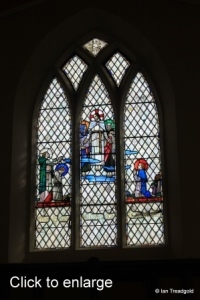 One of the windows on the north side depicts Gabriel being sent by God to Mary in the left-hand pane and the Shepherds visiting Jesus in the manger in the right. 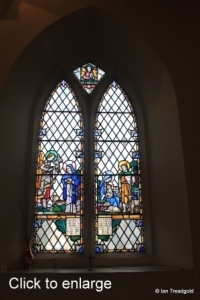 This window was donated by members of the local mothers’ union in 1934. A second shows Jesus in the temple in one pane and the baptism of Jesus in the second. 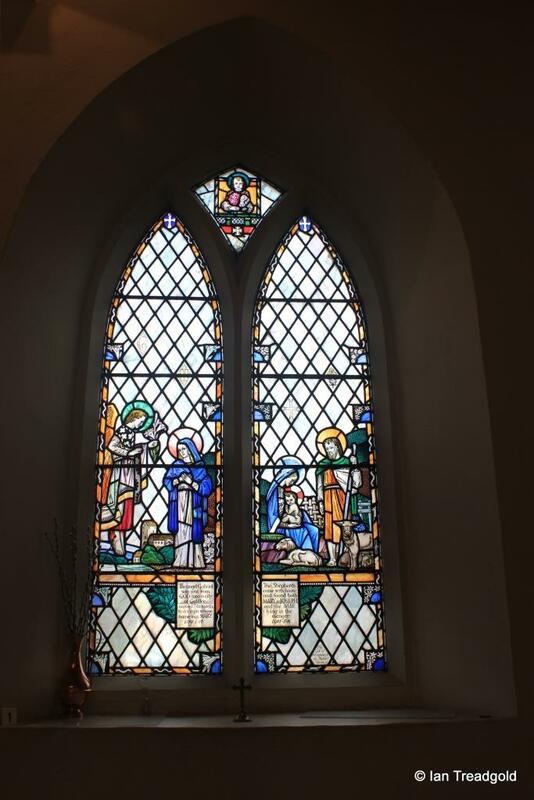 This window was donated by the Children of the Catechism in 1931. Both windows were designed by Warren Wilson. 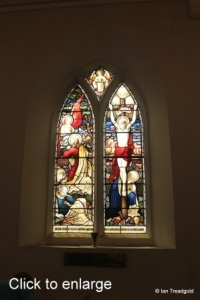 The east window depicts the Ascension of Christ into heaven and was given in memory of George Harold Strange who was vicar between 1920 and 1934. 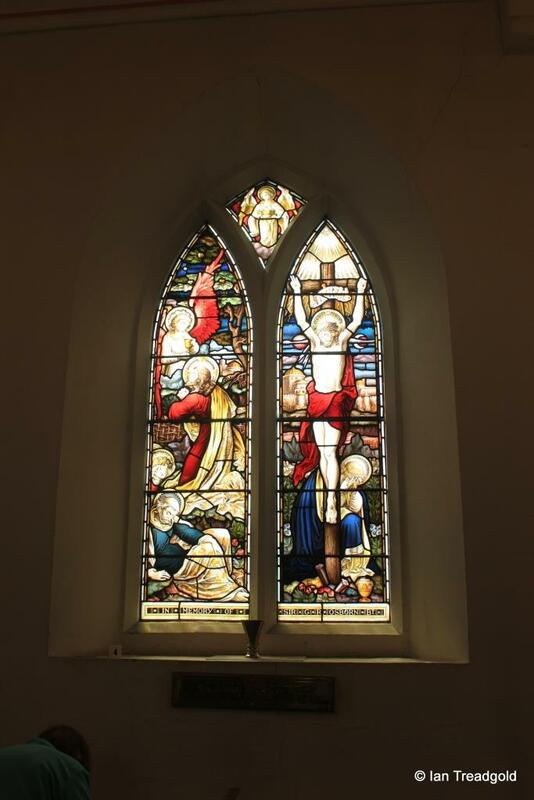 The window dates from 1937 and was also designed by Warren Wilson. 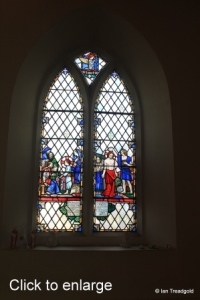 The south side of the church has a window dedicated to the memory of Sir George Osborn who died in 1892 and was donated by his family, friends and the inhabitants of Shefford and Campton. 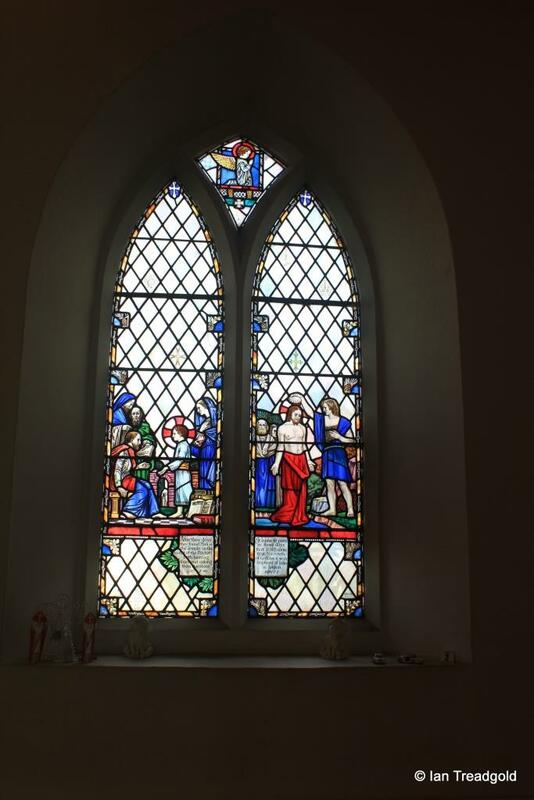 It depicts the crucifixion in the right-hand pane.